The other night I cooked dinner for four girlfriends of mine. 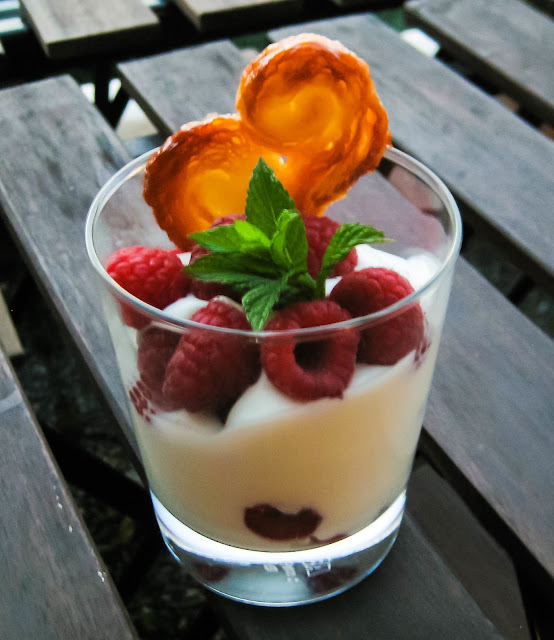 To end the meal on a light note, I prepared a light creme based on quark (sour fresh white cheese) and served it together with raspberries. By adding some sugar and some whipped creme, it becomes a bit sweeter and more fluffy (you can add however much of each as you like). It takes 10 min to prepare and can be served right away. I thought a biscuit or cookie would be nice with it and with coffee. 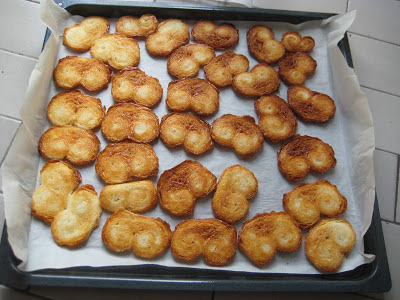 I opted for "coeurs de France" which are super easy and quick to make. And delicious too! 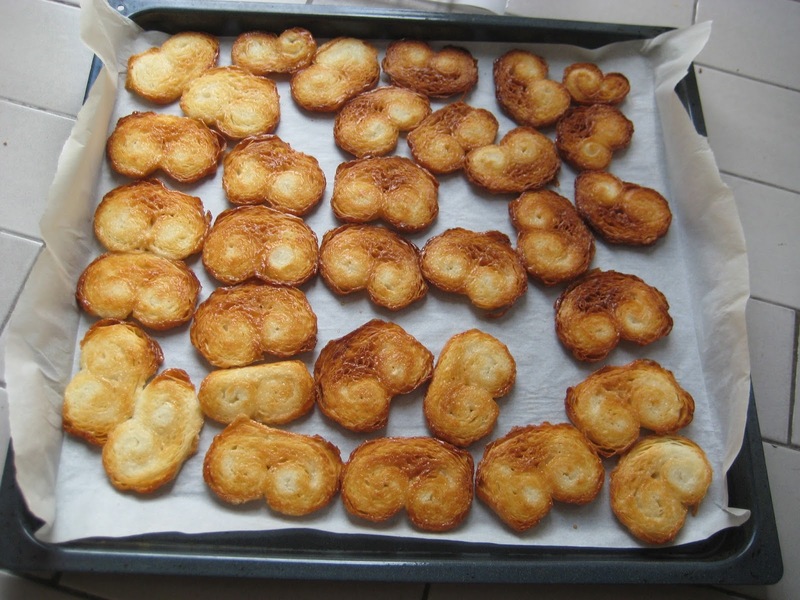 These biscuits are sometimes called elephant ears or palm hearts in France (coeurs de Palmier), but in Switzerland they're called coeurs de France. If you buy ready-made puff pastry dough (pâte feuilletée) it takes 10 min to prepare them and 15 more to bake. Whip up the quark together with lemon and sugar. Whip up the creme and carefully incorporate it into the quark mix. In a cup/glass, put a layer of raspberries, cover them with cream, more raspberries, more cream, and top it all with a 3rd layer of raspberries. Decorate with some mint leaves and serve with coeurs de France (see below). Golden coeurs de France ! Roll out the dough on sugar into a 0.5 mm thick rectangle (that way the sugar goes into the dough). Sprinkle sugar on the dough surface. Roll in both long sides and cut 0.5 mm thick slices. Dip the slices in sugar (always more sugar) and place on parchment paper on an oven plate. Bake in the oven at 220C approx. 10-12 min until golden. Flip the coeurs de France halfway so both sides become golden. Let them cool down on a grid.